Friday's post was slightly delayed due getting caught in a thunderstorm on a bike (eep!). But here is a recipe from the fantastic Lindsey of Family Food Finds. She believes in healthy seasonal cooking for her family. I was especially drawn to her Greek Pesto Pizza from this week. Just your favorite pizza dough, a smattering of pesto, and all the veggies you would find in a greek salad topping the pizza. As my smoke alarm goes off when you heat the oven about 400 F, I will have to swoon at this pizza until I move into my new place! 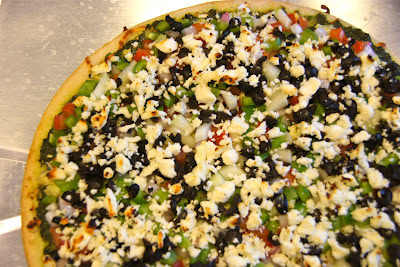 Until then, go check out Lindsey's Greek Pesto Pizza HERE! And to see all of the other Foodie Friends Friday Posts, head HERE! Nice idea for a Friday pizza, and to do something different and a health option.The pesto change the basic pizza.